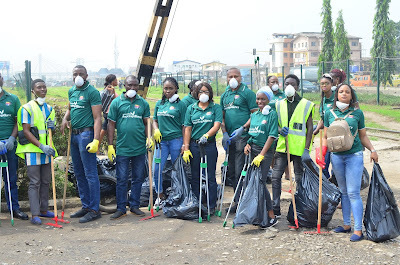 The Food and Beverage Recycling Alliance (FBRA) has been commended by the Lagos State Ministry of Environment as it embarked on a clean-up exercise at the Arena Market in Oshodi, Lagos on Friday in commemoration of the World Cleanup Day, which falls on September 15, this year. Volunteer staff of FBRA member-firms led traders and other users of the popular Lagos market in collecting waste from used polyethylene terephthalate (PET) bottles towards a cleaner and healthier trading environment. The initiative, which received the collaboration of the Lagos State Ministry of Environment, was organised in collaboration with Recycle Points, FBRA’s partner involved in the collection of plastic waste for recycling. The campaign was used to enlighten traders, shoppers, as well as members of Nurses of-air Foundation on crucial issues relating to proper disposal and separation of plastic from metal and food waste, recycling, healthy lifestyle and other measures aimed at curbing environmental pollution. Commending FBRA for the laudable exercise, the Assistant Director of Environmental Services Department, Waste Management Division at the Lagos State Ministry of Environment, Mrs. Tolulope Adeyo said the campaign was worth emulating. She said that the state government would be interested in working with FBRA to get rid of plastic waste from the environment, especially PET bottles from the lagoon and canals, in order to save aquatic lives. According to her, the industrialisation level in the state has generated huge waste and raised concerns from the public and private sector, adding that FBRA’s intervention, either in collection or recycling, has saved the situation to a considerable extent. On her part, FBRA Chairman, Mrs. Folasade Morgan said the initiative was executed to demonstrate exemplary steps for others to follow, as PET bottles causes blockage of drainages in many Nigerian towns and cities. Morgan, who was represented by Mrs. Nwamaka Onyemelukwe, Public Affairs and Communications Manager, The ‘Coca-Cola’ Company Nigeria, said that in order to achieve environmental preservation, Nigerians should imbibe the culture of proper waste disposal and separation for easy recycling into other useful products. She added that the value chain involved in the recycling process of PET bottles could lead to job and wealth creation. According to her, the Arena Market was chosen for the cleanup because it is strategically situated with lots of people and it is a collection hub for its partner, Recycle Points. Commenting on the initiative, Hanaah Afolabi, one of the volunteers from Nigerian Breweries Plc, affirmed that it was exciting showing an exemplary conduct of cleanness and also educating people that indiscriminate disposal of waste, especially PET bottles is not good for the environment. She said although the traders commended FBRA’s drive towards a healthier environment, they urged for more enlightenment programmes and that government should provide more waste facilities. Also, Ahmed Agbomire from ‘Coca-Cola’ stated that he traders and shoppers were overwhelmed with the turnout of volunteered staff. He urged organisations in other sectors to emulate the scheme. The clean-up at the Arena Market was aimed at reinforcing the consciousness of the global action on Nigerians that the environment should be free from plastic pollution, especially waste from PET bottles, which hardly degrade. Founded in 2013 as the Producer Responsibility Organisation (PRO) for the food and beverage sector, FBRA has been adhering to the EPR policy of government, which transfers significant responsibility to producers for the entire life-cycle of their products especially at the post-consumer stages. The Alliance has membership drawn from responsible and forward-thinking companies. These are: Nigerian Bottling Company Limited, The ‘Coca-Cola’ Company Nigeria, Nigerian Breweries Plc, Seven-Up Bottling Company Limited and Nestle Nigeria Plc. The World Cleanup Day is a global social action programme aimed at combating the global solid waste problem, including the problem of marine debris. This year, it would hold on September 15, beginning at 10 am, and spanning the world's time zones until concluding near the international date line in Hawaii, United States.